In recent years, the rapidly evolving healthcare system has reached beyond the typical talents of the CEO and brought new roles into the C-suite to make decisions with broad impacts on patient safety. A 2014 survey conducted by Spencer Stuart and Health Research and Educational Trust, in partnership with the American Hospital Association, found that while some healthcare organizations were working to close gaps through training or expanding the roles of current executives, a majority of healthcare organizations were seeking to expand their executive team with new members who could confront the evolving industry’s new challenges. The result is a growing number of “chiefs” who are making innovation the norm at the executive table. While most executive teams are making strides in getting greater input from the clinicians they manage by promoting physicians and nurses into some of these new C-suite roles, other organizations are looking beyond the healthcare industry to bring innovative thinking to the executive team. One thing is certain: The new chiefs are broadening the type of experience once seen in the C-suite and increasing collaboration across the board. Consider the following positions as just a few examples of how healthcare organizations are innovating in their hiring. 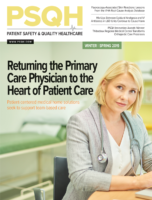 Dennis J. Kain, senior vice president for recruiter Tyler & Co., notes that the new chief population officer (CPHO) role is among the most rapidly growing positions, as healthcare systems look to reach the forefront of today’s shift toward wellness-based care. It’s a role that requires a nontraditional way of thinking and, in some cases, an ability to encourage others throughout the health system to shift their mindset from finding solutions to problems to outright preventing those problems. The ability to collaborate and build relationships is a must for this role. In many cases, the CPHO comes with experience in building quality and safety programs. For example, Englewood Hospital and Medical Center appointed Kathleen Kaminsky, MS, RN, NEA-BC, as CPHO in 2016 from her role as senior vice president for clinical effectiveness and chief quality officer, and interim chief nursing officer. In the CPHO role, Kaminsky oversees the development and implementation of the hospital’s population health management strategy, encompassing clinical integration across a broad continuum of care that includes accountable care organizations. She provides strategic and operational leadership. While a number of today’s CPHOs have a background in clinical work, a 2014 report from Strategic Market Insight suggested that physicians may not always be the prime candidate for this role. It advised considering candidates with degrees in business or health administration, as well as public health experience at a state or national level. As the name implies, the chief patient safety officer (CPSO) is responsible for overseeing patient safety initiatives. At a time when medical errors and safety initiatives are under increased scrutiny, it’s a role that requires broad collaboration and great innovation. Many executives filling this role come from a physician background. Among them are Shannon Connor Phillips, MD, MPH, who in March moved from a role as a physician lead in Cleveland Clinic’s Office of Clinical Transformation to become Intermountain Healthcare’s chief patient safety and experience officer. Phillips, according to an Intermountain news release, will use this role as a platform for collaborating with other Intermountain leaders to improve outcomes, safety, and the patient experience. Collaboration is also a focus for Scott Betzelos, MD, MSA, Inova Health System’s CPSO. In this role, Betzelos collaborates with medical staff leaders in developing initiatives to improve process quality and physician engagement. However, not all chiefs come to this role with a background exclusively in healthcare. Prior to serving as the director for the Center for Health Engineering and Patient Safety at University of Michigan, Ann Arbor, James Bagian, MD, PE, was chief patient safety officer and director for Veterans Health’s National Center for Patient Safety. He is also a former astronaut, having flown on two shuttle missions and served 15 years with NASA. As Dr. Bagian told Slate, his background in “high-reliability industries—the ones that operate under conditions of high hazard yet seldom have a bad event” gave him a perspective on risk reduction focused on understanding what leads up to an adverse event and what changes must be made to reduce the likelihood of it happening again. It’s a perspective much needed in healthcare, where there remains a focus on—or fear of—finding the person who led to an event to assign blame. Today, with reimbursement riding on the result, the patient experience is everything in healthcare. The role of the chief patient experience officer (CXO) is to create relationships with patients, and improve patient- and family-centered care. But this professional also can serve as a point person for accountability, ensuring that the healthcare system is putting effective programs in place. Adrienne Boissy, MD, MA, CXO for Cleveland Clinic, shares that hospitals cannot deliver a superior patient experience without providing safe care, high quality, or high value. According to a 2016 report by Vocera’s Experience Innovation Network on the Rise of the CXO, there is still an exploration of how experience, quality, and safety roles relate to one another. In most healthcare organizations, quality/safety, performance improvement, and experience leaders are peers, while in other organizations experience leaders manage safety and performance improvement functions—after all, quality and safety are key to the patient experience. Many CXOs are leading improvements in building teamwork and improving communication across the system. Boissy, for example, led an initiative to train more than 3,000 Cleveland Clinic physicians in relationship-centered communication skills in six months. According to Vocera, medical degree holders like Boissy are exceptions in terms of the background expected for a CXO—they more often come from a background in administration or nursing. The American College of Healthcare Executives calls the chief compliance officer (CCO) one of the most sought-after roles today. These individuals ensure that the board of directors, management, and all system employees comply with the tangle of rules, regulations, policies, and procedures. The CCO may develop standards and implement procedures that ensure the healthcare organization can effectively identify, prevent, and correct compliance problems, according to the International Association of Risk and Compliance Professionals. When it comes to ensuring everyone is playing by the roles, a law background can help. For example, Howard Hacker, a member of the Texas bar, joined Tenet Healthcare Corp. as CCO and senior vice president in 2016 after more than a decade at Pfizer Inc. where he served in leadership roles within Pfizer’s legal and compliance teams. In the CCO role, Hacker is tasked with oversight of the company’s ethics and compliance program. However, professionals also come to this role with backgrounds in medicine and finance. As this role has evolved, CCOs have sought to find ways to prevent compliance problems, according to the Korns Ferry Institute. A survey of CCOs found that these executives battle a reputation as “the compliance police” despite their goal of proactively creating solutions. Jackie Baratian, a partner in Alston & Bird’s Washington, D.C. office, adds that these professionals can play an important strategic role through close collaboration with other members of the C-suite. Many of these roles have emerged as a reaction to the changes and problems being faced today in healthcare. To help organizations take a more proactive approach, many systems are bringing chief innovation officers (CIO) on board. In many cases, these professionals come from outside the healthcare industry, bringing fresh ideas with them. For example, Mercy Health appointed Jeffrey Carr in 2016 as the system’s first-ever CIO. Reporting to Mercy Health’s chief strategy officer, Carr holds responsibility for applying his experience in the technology industries to help the health system foster a culture of innovation and investment. Prior to this role, Carr was the entrepreneur-in-residence at Cintrifuse, a service provider for startups across Cincinnati. For many businesses, innovation is as simple as looking beyond silos to see how other industries are evolving. Now healthcare is seeing more professionals take on this transformative responsibility.